For any fly fisher who has bothered to flip a few rocks over, it is no secret that caddisflies are one of the most prevalent insects in trout streams. Of the many caddisfly hatches that western U.S. trout anglers encounter, few are more promising — in terms of bug volume and fish activity — than the Mother’s Day Caddis (Brachycentrus occidentalis). 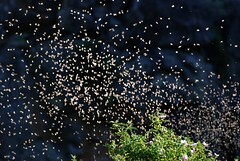 In fact the challenge that fly fishermen experience during this hatch is that there are often too many bugs on the water for the trout to choose from, causing dry flies to get lost in the crowd. One tactic to overcome this obstacle, according to author Dave Hughes, is to leave your dry flies at home and swing a soft hackle down and across. Hughes explains that one of the key advantages to this technique, other than not having to find your imitation drifting amongst thousands of naturals on the surface, is that you are simultaneously able to imitate the rising pupa and sinking adults.